Harry Love (1809-1868) – Love was the head of California’s first law enforcement agency, the California Rangers, and became famous for allegedly killing the notorious bandit Joaquin Murrieta. Love was said to have known Davy Crockett and Sam Houston in his boyhood and had a brother who died at the Alamo. He fought in the Blackhawk Indian War in 1831 with Abraham Lincoln, and later in the Mexican-American War in 1846. He was also a scout, an army express rider, a Texas Ranger, and an explorer of the Rio Grande in 1850. He then moved onward to California, but after failing to make his fortune in the gold fields, he became a deputy in Santa Barbara, California. 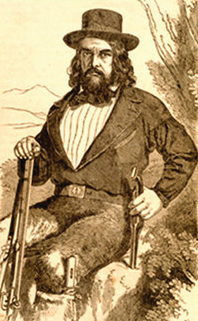 On May 11, 1853, California Governor John Bigler signed a legislative act authorizing the organization of a band of the California Rangers under the command of Captain Harry Love. Their purpose was to capture or kill the infamous bandito Joaquin Murrieta, ringleader of a gang of men believed to be responsible for much of the cattle rustling, robberies, and murders taking place in the Mother Lode region. In July of 1853, the Rangers came across the group of bandits near Arroyo Cantúa in San Benito County and in the ultimate gunfight, killed two of them who were allegedly the famous Joaquin Murrieta and his right hand man, Three Fingered Jack. Love was killed in June, 1868 in Santa Clara, California when he was in a wrestling brawl with a man named Christian Ivorson. During the scuffle, Harry’s own pistol accidentally discharged into his armpit and Love died the next day.